@snufkin wrote: Real talk, I always figured Han being a "Han shot first" type of self-serving a**hole was somebody who had a woman in every port and slept around without emotional attachments before he met Leia. Which obviously is going to work for a Disney backed film meant to appeal to all ages. And in the original version of the first movie, he was shown as much. Including getting a drink thrown in his face for calling a woman by the name of a different girlfriend. If anything giving him a teenage girlfriend/first love makes him "too nice" to the way I've thought of the character. Yeah, it seems they chose the route very early on (by cutting out that alternative Cantina scene) to go with Han as more of type of a guy who plays being though but basically underneath that's not what he really is. If Han took the Coaxium for himself he would be a rich man. But that's not Han from ANH - he's broke (he NEEDS the credits Obi offers him for a job) with Jabba's team breathing down his neck. @Darth_Awakened I'm too lazy to dig it up, but I've posted before an article about how Lucas originally wrote/filmed Han's introduction to show that he's a womanizer. But changed it because he felt that would be out of character for the type of person Han is eventually revealed to be. It does work if you consider how one of the influences for that part of the OT's story, the criminal underworld, was influenced by movies like Casablanca. And we know that underneath Rick's cynical, take no sides and look out for myself exterior, is somebody who actually does care and has hardened because he had his heart broken. I'm almost surprised that they didn't have Qi'ra tell Han something to the effect of "We'll always have Corellia (or Kessel)." Part of the twist for him at the climax of the first movie that they seem to have incorporated into the ST is that despite being in debt to Jabba and needing the credits (which he extorts out of Obi-Wan and Leia) is that he comes back to rescue/help Luke because Obi-Wan sacrificed himself to save the rest of the group. Which is why his son is named Ben, among other things. 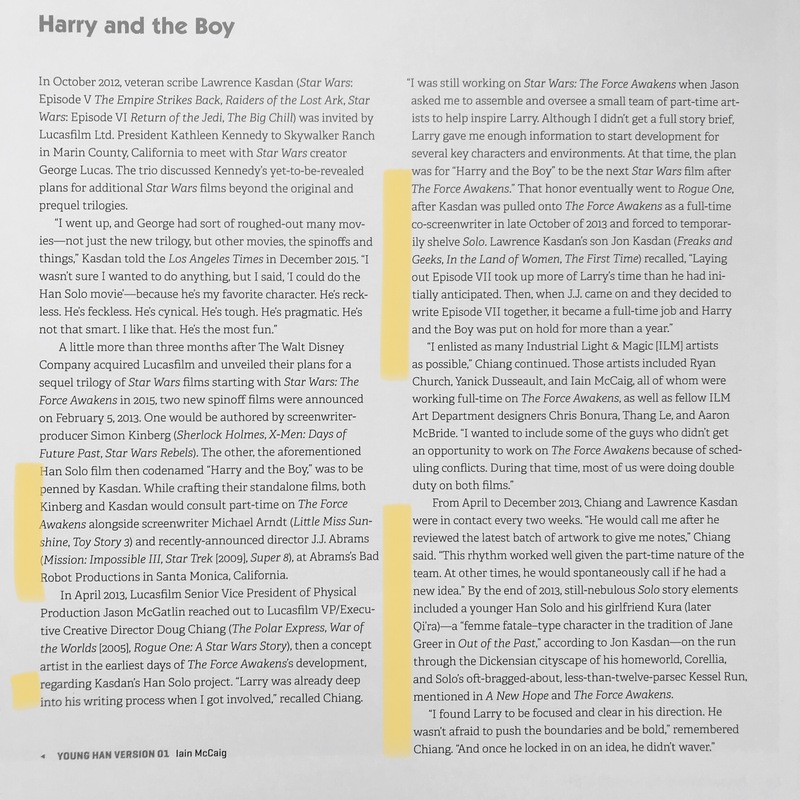 @snufkin wrote: @Darth_Awakened I'm too lazy to dig it up, but I've posted before an article about how Lucas originally wrote/filmed Han's introduction to show that he's a womanizer. But changed it because he felt that would be out of character for the type of person Han is eventually revealed to be. It does work if you consider how one of the influences for that part of the OT's story, the criminal underworld, was influenced by movies like Casablanca. And we know that underneath Rick's cynical, take no sides and look out for myself exterior, is somebody who actually does care and has hardened because he had his heart broken. I'm almost surprised that they didn't have Qi'ra tell Han something to the effect of "We'll always have Corellia (or Kessel)." Part of the twist for him at the climax of the first movie that they seem to have incorporated into the ST is that despite being in debt to Jabba and needing the credits (which he extorts out of Obi-Wan and Leia) is that he comes back to rescue/help Luke because Obi-Wan sacrificed himself to save the rest of the group. Which is why his son is named Ben, among other things. Thanks for the Casablanca parallel. You can also add "a beginning of a beautiful friendship" when Chewie is concerned. On the other hand - I was only replying more to myself than to anyone else - that Han's characterization in Solo is not far off at all of the one used in the OT and later on in TFA. Not to mention - much more than subtle parallels to his son. The weak heart of Ben's father according to Snoke is showing everywhere in the Solo movie. So much about the plot gate..
@Darth_Awakened The only Plot Gate is that Lawrence Kasdan came back (and brought his son with him) to collaborate with George Lucas on his idea to do a standalone movie about Han's life prior to the original movie. And in the process started noodling around with the franchise's overall themes and arcs. So that the ST is partially about Han's character and legacy as played out through his son as tension between these two different families (working class scoundrels versus Force prodigies/royalty). Which once I started noticing the details and thinking about it, the more clear it was what the trajectory Solo and the ST were following as far as the Kylo Ren/Ben Solo/truth that is your family part of the story goes. Which I take it for it is and am enjoying it. Though it is disappointing and frustrating in light of Carrie Fisher's death that they chose to go that route versus digging into Leia's side of things a la Bloodline about the tragedy and baggage from who her biological parents were versus her adopted/chosen parents. But the Casablanca angle is something they always mentioned for Han, including how Jabba originally was meant to be like a Sidney Greenstreet character (and yes, Solo is the start of a beautiful friendship between a human and a Wookie). And it's been awhile since I've re-watched, but I remember how part of the exposition for Rick mentions that he's fought in several wars already, including being part of the Loyalists/Lincoln Brigade in the Spanish Civil War. @californiagirl wrote: Speaking of SW fans we know hating Solo, here's Jenny's take. She hated like 90% of Solo. Like 50-minute video didn't like it, and she never makes videos this long. Also the Knights of Rant were not fans at all either, their podcast is up. They were actively telling people on Twitter to not watch it because they were way saltier than intended. This is what I’m talking about when I say “nitpicking the logic” of the movie. Jenny didn’t do this with TLJ which she mostly gushed about... You could criticize the heck out of the logic of TLJ’s plot, but she didn’t feel it necessary. I dunno. It’s like people who don’t like things these days are trying to convince others not to like them too. Spot on. Youtube kept pushing this video to me, so I took a peek, and I'm frankly mystified how anyone who loved TLJ can nitpick Solo like this for its plot problems. I suppose it's all about what grabs you, and what doesn't. Solo grabbed me, so its flaws didn't detract from my enjoyment. TLJ never grabbed me, so the entire experience of watching it felt like keeping tally of everything that was wrong with it. I do find it an interesting phenomenon overall that many people who hated TLJ want Solo to fail for TLJ's sins, and many people who loved TLJ want Solo to fail to... I don't know, in order to prove that the ST is superior to anthology films? I guess? That's the way it feels like, a lot of the time. Either way, it's certainly trendy to hate Solo. Even if it were a poorer film than it is, it wouldn't quite deserve this kind of gleeful pitchfork mentality. The T-shirt you owe me says it all: I'am too old for this SITH! Plot holes aside - I'am sticking to my opinion that Solo is a fun movie something I would expect of a movie revolving around Han Solo. I can't help but roll my eyes on #unnecessary# argument (sorry guys it's nothing personal - just my take on things). So what is necessary in the SW Universe now? And how come "unnecessary" argument is suddenly IN now out of nowhere when the film is out - when no one has been speaking about it - let's say a year ago? Another movie about the Death Star? Kenobi movie ? - when everything important around Obi was covered in the multiple installments - and don't tell me that the movie about an old hermit sitting on a rock staring at the twin suns sunset while watching over his young protegee would be interesting? Movie about young Luke and his adventures at the Toschee statiton? Bobba Fett? Darth Maul? Poe Dameron? adventures? (just joking). Truth to be told - I'd watch all of the movies mentioned above (some of them with less interest some of them with more )except the Poe one and probably wouldn't think of any of them as unnecessary. The SW fandom is full of WTF moments - and I must say I'am becoming very fatigued with everything. December 2015 - Everybody and their mother: Ay ay ay they killed Han Solo - my childhood hero! How can I live without him. I'am ruined. That Kylo must die!!!!! May 2018 - Everybody and their mother: Han Solo? Who? We don't need a movie about him. Moving on to an actual discussion by people who've both thought deeply on the topic of Star Wars stories and its characters and (unlike various social media personalities) actually have an impact on the stories being told, the Writer's Guild of America talk with Rian Johnson and the Kasdans is up on YouTube. I haven't watched it all the way through yet, but have no doubt it'll be full of some of the details we noticed from Kasdan's previous WGA talks which were clues for both Solo and the ST.
1. He wrote the Interrogation Scene and came up with the idea of a Force Bond happening in that moment with Rey being able to pull on Ben's skills/feelings. Confirmed after TLJ's release in LF PR by the head of the Story Group. 2. Co-writing the bridge scene with his son and various lines like "weak and foolish like his father," "I thought you'd want me to stay away because when you see my face, I remind you of him," were an anvil being dropped on the audience's head that like father like son. Which Snoke's whole "too much of your father's heart in you, young Solo" was an even bigger anvil of like father like son. 3. That the story Solo tells and how it depicts Han at that age would inform both who his son is as well as the very different relationships Rey has with both Han and Ben inform their respective character arcs. 4. The Kurosawa line he frequently quotes at these events, that "the villains are completely formed; the heroes are evolving" is about Han is also about Ben and Rey. They both definitely are evolving, even at the end. And Hux exists as a foil because he's completely formed, a true villain in contrast to the newly minted Supreme Leader. 5. 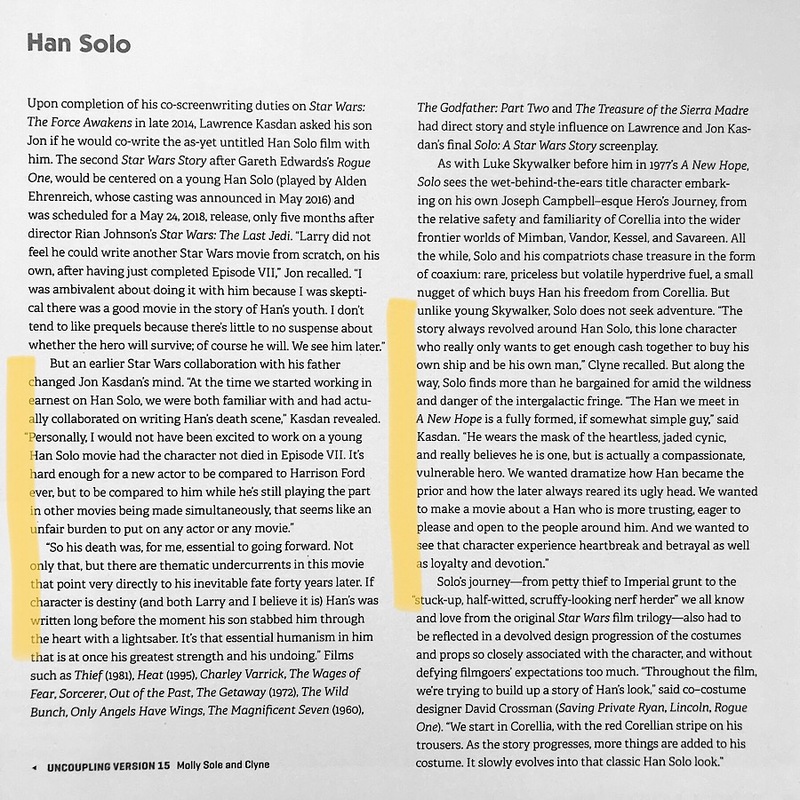 He's not just writing Solo but consulting with LF on the ST and the overall arc as it tells a parallel story about Han and the world/people he represents. 6. "This will make things right" refers in part to the more bittersweet conclusion to the OT he wanted to write for RotJ (Han sacrifices himself for a greater cause, Luke isn't fit for human society because of all the weird Force sh*t he's seen/experienced as a Jedi, and Leia has the dual responsibilities of being both the mother of she and Han's child and a chaotic new society formed out of war) but got vetoed is how the ST opens. The way he wanted it to be for the OT3. Go check most online spaces where SW fans congregate and it's only in the past 3 weeks that most of them have figured it out and are somehow outraged. Funny how most of us got told 2 plus years ago that we were delusional, didn't understand SW and what the new films were supposed to be about, but somehow figured this out far ahead of these other fans who somehow knew better. For extra LOLs, just contemplate how so many of these fans who are outraged over his influence over the ST are fans because of the OT and the character arcs he wrote. I haven't kept up with this thread, but just wanted to put out some Solo thoughts. I liked it, more than I thought (I wasn't even going to go see it, but my mom wanted to so I went with her and her husband who both liked it too) I was apprehensive about Qu'ira, but she was fine if rather superfluous. Enfys Nest was great at first, then lame. L3 and her cause was a joke. Landon didn't seem swarmy enough, same for Han really (this is most likely retroactively making them more heroic) I really liked the heist and action scenes and hearing that asteroid field music again while the MF flew was amazing. The Darth Maul cameo was great. The continued relevance of the dice was very satisfying, as was the quick conversation about fathers between Han and Lando. All in all, perfectly serviceable movie but didn't really deepen my understanding of the characters or world. Han is Kasdan's favorite SW character. As he recently said in a different article, he agreed to do a young Han movie before he was involved in the ST, shortly before the Disney purchase of LF. The Q'ira-like character and the Oliver Twist-y opening were there from this very early period. Kasdan Jr. (this is what I will refer to Jonathan Kasdan as) came on after TFA, and thought of all these boys' adventure stories, and wanted a more complicated mentor figure who would teach Han he needed to be the one who shoots first. Solo was daunting to write because it was right after TFA, which was written under great time constraints, this we know. They assumed they would work on it for a while and then hand it off to someone else, but something about the "circumstances and machinations of Disney", plus the director debacle, meant they were on the project for 3 years. Rian gushes over Alden's performance! Lando was always going to be in the movie, but it was Kasdan Jr. who was more passionate about Lando, just loved him, and made him a bigger part of the film, he became more prominent as they went along, and more so when the directors came on. So everyone complaining there wasn't enough Lando, imagine that there would have been even less of him if was just Larry. Donald Glover was not as huge when he auditioned as he is today. Kasdan Jr. likens his role to Han in ANH. Kasdan gushes over Glover. Ron Howard seems very sweet and supportive and open to ideas, Kasdan gushes over him too. He jokes he must not be from this planet. The script evolved quite a bit, as they were given much creative freedom, with very little input from LF. The movie that was supposed to come after Solo was pushed down the road (I have no clue which film this was), and that's how Solo got "thrusted" into the 2018 release date. L&M spent a weekend in Colorado with the Kasdans immediately after this shift. Throwing ideas around because L&M have a fluid process, since they came from TV, and all enjoyed themselves very much. They would try to incorporate as many of those ideas as they could, and the next draft was pretty close to the movie we have now. L&M had a 4-5 month experimental period and ended up with something kind of close to what the Kasdans had, and KK got the Kasdans to give it another pass. It was Jonathan in London with L&M, Larry working with them remotely from LA, to get it to a point where the movie could be greenlit. The differing approaches and tonal issues started coming up here. Kasdan had certain things he really wanted, L&M other things they really wanted, and the two apparently did not have the same level of passion or priority for all the same things. They turned in the script in October (I think this is 2016?) and the studio liked it. Then it was production issues and falling behind schedule. The shift from L&M to Ron Howard was "incredibly painful" and the last thing anyone wanted. I remember some recent article, I think it was the Variety one, that told the story Kasdan Jr. tells here, how Ron Howard happened to be in London at the time. KK invited the Kasdans to the breakfast they were having, and he was a little weirded out because they kept asking questions about what he was working on at the time, and he finally asks how Solo is going. He was ambivalent about for a week, then fully went for it. I recall JJ was reluctant at first as well. He and the Kasdans worked very closely together with every scene and all they had to redo. But they credit much of the comedy and off the wall stuff to L&M. Kasdan Jr. says (he does most of the talking actually) KK plays close to the vest about what she's developing. Apparently she's had conversations with most of the filmmakers you could get excited about doing a SW movie. She isn't going out with a mindset of this movie must be this, and this other movie but be and do and set up that. He says she just wants to make good scripts and movies. Rian adds that she wants each movie to be personal to the filmmaker and it shows in the movies. Someone here said the other day that if KK were replaced, especially right now, it would probably be some Disney studio exec and get even more corporate and Disneyfied than the fanboys are crying that it is. There's a funny bit about how the half-mountain lion alien version of Dryden Vos with the original actor, which they realized would be like Q'ira being unable to decide if she loved the handsome young Han or the cowardly lion from The Wizard of Oz. Rian Johnson talks about the love-hate relationship he has with Twitter. He loves interacting with fans, and emphasizes how most of the feedback is positive. Kasdan Jr. says he's newer to Twitter and more of a pessimist than Rian. Older Kasdan is not a big fan of the internet. He said he liked when people didn't have such an easy way to express their opinions (applause ensued). Miller took the "we don't serve their kind here" line from ANH, which he thought was hilarious, and ran with it, and the Kasdans went off that because they didn't like writing C-3PO back in the day, and so L3 the social justice warrior droid was born. Kasdan gushes about Phoebe-Waller Bridge. Many of her lines are improvised, since she's a comedian. Releasing the movie is the most stressful part of the process for them and Ron Howard. Rian can't wait to get back in to SW. He wanted to make something new from the ground up without the certain iconography SW has. Kasdan says SW is evolving as more people get involved and make their projects. Both Kasdans seem excited about others' upcoming SW projects. They left Solo open for more stories, it's not in their power to decide if that happens or in what form it happens. Kasdan says Han shot first, and he wanted to make a movie where it was very clear he shot first. 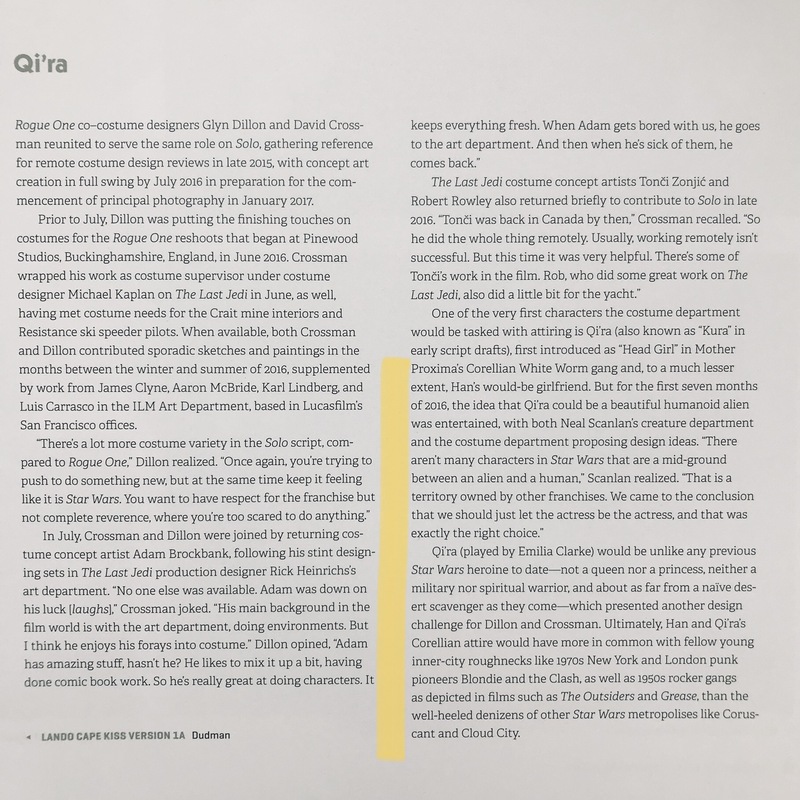 I think the idea for a Solo movie originated from George Lucas - I believe it was mentioned in the Art of Solo book? (one of his leftover ideas/drafts + Kasdan only agreed to TFA on the condition he could work on the Solo movie), so the people mad at Kathleen Kennedy: it wasn't even her idea in the first place. Quite interesting that they wrote it right after TFA, reinforces any potential character parallels. This project was in development for a long time, damn. On the twitter thing, I remember Rian saying he loves using it, and that the appreciation/love he gets drowns out the hate, but I do remember listening to a podcast/interview where I had the impression that he would have been even more open/interacted with the fans more if it hadn't been for the crazy amount of vitriol/hate smothering any sensible discussion or analysis. Before TLJ I recall him saying numerous times that he was very excited to share the movie and couldn't wait to discuss it. Was he referring to his trilogy when he said that he wanted to make something new without the iconography? Because that is incredibly exciting and exactly what I wanted to hear. SW needs to evolve and if it gets us away from OT nostalgia as well as Rebellion/Empire rehashes with all the TIE Fighters/X-Wings etc that comes attached to it, then all the better! It'll be a real test, but RJ is more than up to the challenge, IMO. Sounds like he must of made some progress on his script. Also, not surprising that Han is Kasdan's fave. I think that's been a well known thing since the 80s? So did Kasdan Jr. write the Kylo/Han scene with his dad then @snufkin? Because if so, then it's incredibly obvious as to Kylo's fate. 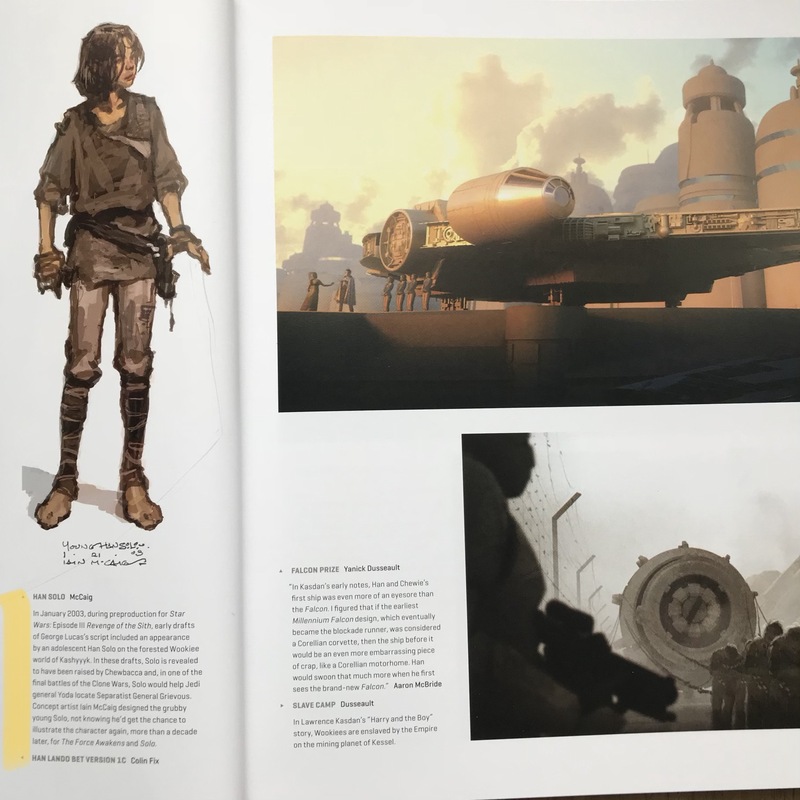 I think the idea for a Solo movie originated from George Lucas - I believe it was mentioned in the Art of Solo book? (from his leftover ideas/drafts + Kasdan only agreed to do TFA on the condition that he could work on the Solo movie). So the people who are angry at Kathleen Kennedy: it wasn't even her idea. On the twitter thing, Rian has said previously that he still likes to use it because the appreciation/love he gets drowns out the hate, but if I recall, the impression I got from listening to one of his podcasts/interviews was that he would have been even more open to/interacted with fans had it not been for the crazy amount of vitriol smothering any chance of discussion or analysis. IIRC, pre TLJ he was very excited to share and discuss the movie with fans. Not saying he didn't do that, but having haters clog up your mentions every time you make a tweet has got to be incredibly tiring. Still happening, 6 months later. About making something new without the iconography, was that referring to his trilogy? Because if so, that is very exciting and exactly what I wanted to hear. SW needs to evolve, move past OT nostalgia, Rebellion/Empire rehashes and all the TIE Fighters/X-Wings etc. He must have made progress on his script. Also, Han being Kasdan's favourite is something that has been known since the OT I think? Nice to have that confirmation. So did Kasdan Jr. write the Han/Kylo scene with his dad then @snufkin? ...what conclusions are we meant to draw about the ultimate meaning of the relationship between these two characters and how both the actor and senior writer have invested their own personal relationship with one of their sons into this scene? It doesn't really strike me as an observer based on what I've read/seen from press coverage that either of these men would invest that part of themselves as parents into the story, especially the relationship with one of their sons, if the outcome is meant to be a Greek tragedy. @Kylo Rey Yes, it was GL's idea, but he doesn't say that here. Probably because George isn't part of LF anymore, and it's a little awkward mentioning him now at times. @snufkin wrote: @Darth_Awakened The only Plot Gate is that Lawrence Kasdan came back (and brought his son with him) to collaborate with George Lucas on his idea to do a standalone movie about Han's life prior to the original movie. And in the process started noodling around with the franchise's overall themes and arcs. So that the ST is partially about Han's character and legacy as played out through his son as tension between these two different families (working class scoundrels versus Force prodigies/royalty). Which once I started noticing the details and thinking about it, the more clear it was what the trajectory Solo and the ST were following as far as the Kylo Ren/Ben Solo/truth that is your family part of the story goes. Which I take it for it is and am enjoying it. Though it is disappointing and frustrating in light of Carrie Fisher's death that they chose to go that route versus digging into Leia's side of things a la Bloodline about the tragedy and baggage from who her biological parents were versus her adopted/chosen parents. But the Casablanca angle is something they always mentioned for Han, including how Jabba originally was meant to be like a Sidney Greenstreet character (and yes, Solo is the start of a beautiful friendship between a human and a Wookie). And it's been awhile since I've re-watched, but I remember how part of the exposition for Rick mentions that he's fought in several wars already, including being part of the Loyalists/Lincoln Brigade in the Spanish Civil War. I'm gonna be that person, but I didn't really like it. Was it bad? No, but it was...pedestrian? I though Alden was actually very good. I thought he embodied a young Han Solo very well and there was some great insight into the character of Han, but the film overall didn't really do much for me. It left me wanting. Also there were a few light filters that were a little distracting, but that's neither here nor there. @Tex How was the lighting at the theater you saw it at? Quality of the story aside, apparently a lot of chain theaters have done a crap job with the correct resolution for the screening so that it shows the lighting/colors/contrast that Bradford Young used. I'm almost tempted to go see it in IMAX (save for the $$$) because I had the same experience with Last Jedi, when you see it screened with the correct settings and can appreciate the photography. ‘Solo’ Theater Projection Problems Leave Fans In The Dark, Enrage Industry Veterans Cinematographer Bradford Young's low-light cinematography highlights how many theaters no longer meet decades-old industry standards. 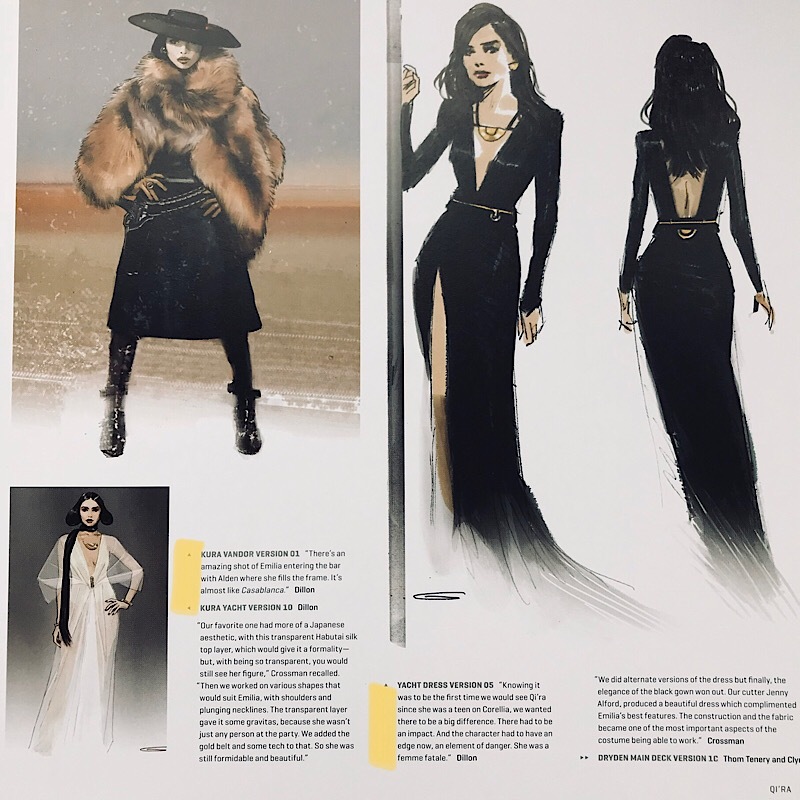 @Armadeus - My eyes have rolled so hard out of my skull over any SW fan complaints about Qi'ra being coded as a femme fatale with the dismissal that it's just a tired/stock cliched character. Nevermind that there's an entire f**king school of feminist film theory/criticism around that genre and the Golden Age was far better for female roless than found in contemporary cinema. 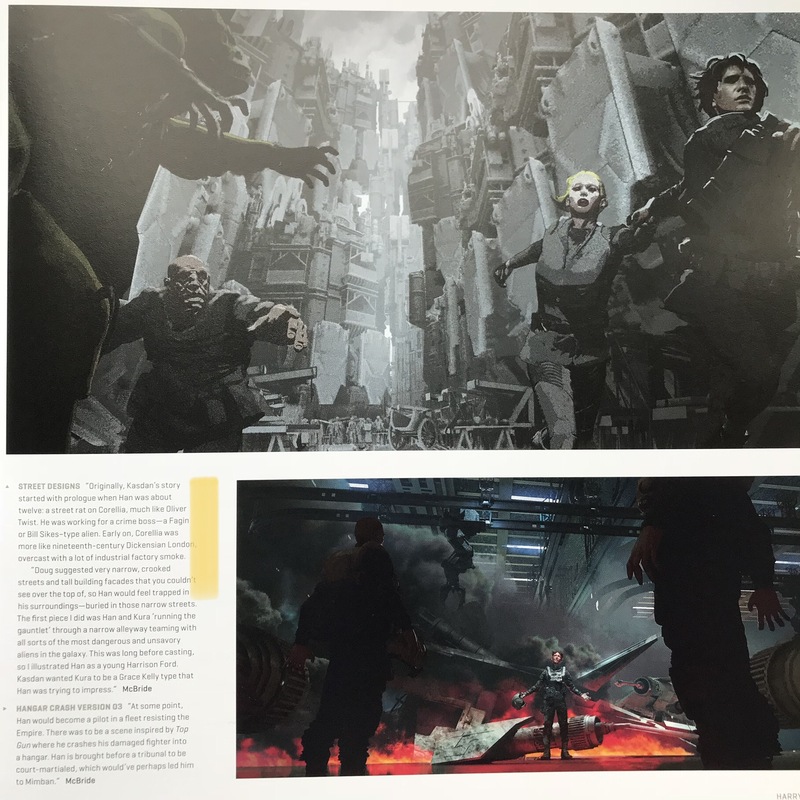 As for Qi'ra, when they've mentioned the film noir references being Out of the Past, especially Kathie Moffat. The question with that film is who does she double-cross? Is it Vos by using his affection for her to ultimately kill him and assume control of his operation? It feels like it's meant to be some amount of loyalty to him, that she likely was trafficked and he ran across her that way, was taken with her/saw potential (shades of Snoke and Ben) and cultivated her. Was there meant to be a follow-up where she'd emerge even more as less of an ally to Han and more of a complicated relationship? The film does drop one of its anvils (so much of the movie telegraphs things to the audience about Han and about the arc he's at the heart of in the ST) with her line to him when they're escaping about it being a larger galaxy without the patronage/protection they have from Lady Proxima. Part of the difference between these two characters that's clearly shown is that while Han is a free spirit who doesn't like taking orders from others (hence his whole speech to Leia at the start of their relationship), Qi'ra is more strategic and seeks both patronage/protection before assuming that role herself. Also something I've considered is that the whole Maul reveal is about the "you're always working for somebody/there's always somebody higher up" line the filmmakers have said is a theme. So ultimately Han's approach may be riskier but he's also never going to run into somebody higher up on the food chain from his position. On a side note, speaking of film noir am I alone in noticing that there's a bit of Deckard and Rachel in Ben and Rey's relationship? Because that whole relationship is about somebody who's a hired gun/enforcer falling for his mark when he glimpses the memories and defense mechanisms she's built up over a loving parental relationship which never existed. Or in Rey's situation, it's a compulsive lie she tells herself and others because of the shame/pain over what her parents did to her. Ben glimpsing her memories of what happened versus what she tells herself and the world is pretty close to Deckard having the photo Rachel keeps with her and then discards once he confronts her about the truth. And in that film, it ends up forcing him out of his own defensive mode and becoming empathetic/falling in love with her. I suspect that's some of what they've been noodling around with via the Force Bond. I saw the film at Alamo Drafthouse. Mostly it was the orange/amber filters and the blue filter on the Falcon that didn't pop for me. I was hopping we'd get a neo noir vibe from the film in terms of lighting, but the colors seemed a little flat. Also in regards to your discussion about Qi'ra. 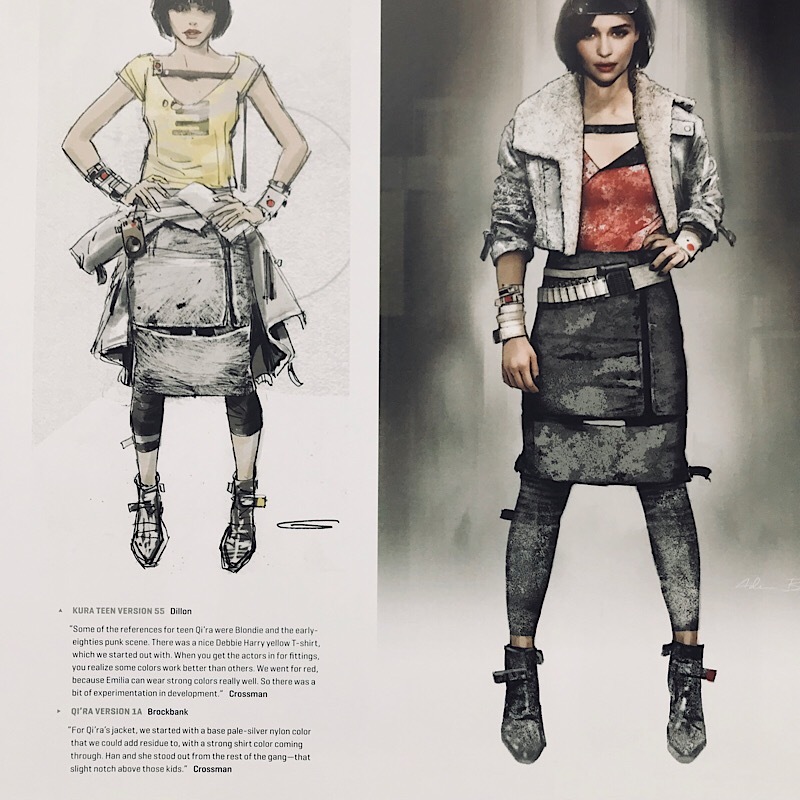 I think they didn't embrace the femme fatale role enough, I wanted to see more of a change from her time with Han to her time separated from Han. but that's just my opinion. Anyhow I totally geeked out and bought The Art of Solo book. If anyone is interested here’s a few of the pages from the beginning chapters. I did t realise I had been on the agenda for so long. @Tex Yeah I couldn't tell if they kept her ambiguous at the end because the plan is to do a further film where they'd set up an arc with outright betrayal. Hence the speculation here that his "better her than me" line at the start of his relationship with Leia is because of something s*** that happened with Qi'ra. Or if her betrayal is more about breaking from Han's expectations of her as well as killing off Vos. @Tex I had problems with the light as well. You're not alone. Anyhow I totiallt geeked out and bought The Art of Solo book. If anyone is interested here’s a few of the pages from the beginning chapters. I did t realise I had been on the agenda for so long. I did a double take at this pic. I know that's supposed to be Han on the top right... but my head said, "Kylo???" It's Han with Kylo's hair. @MrsWindu Thank you for posting those! 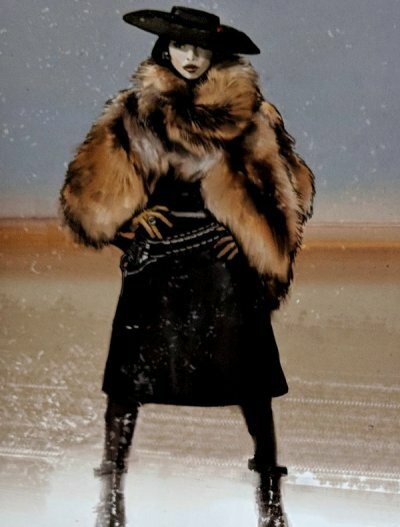 Funny thing, I'm a huge Debbie Harry fan and maybe that's why I liked Qi'ra's outfit when they're introduced on Corellia. I've read a description of the scene where they were going to show Han crashing a Tie-Fighter which leads to him getting booted from the flight academy and honestly I wish we'd seen something like that for a set-up. Instead we get the one scene where he mutters back to his CO about their mission being that they're invaders on that world.